I am going to spice things up today. Literally and figuratively. While I have been to many restaurants, I don’t share my resto reviews here. (I save them for Happy Cow – follow my profile). But, what if I told you I could give you the recipes for all the dishes we tried? I figured that was worthy of a share on a recipe blog. This was a marvellous meal Rob and I shared at Doug McNish’s Public Kitchen. He typically caters to take-away meals and Sunday eat-in brunch but occasionally there are pop-up specialty dinners. This was one such dinner titled “Vegan Everyday“, named after his latest cookbook. Known for his love of raw vegan foods and writing two raw cookbooks, Eat Raw, Eat Well and Raw, Quick and Delicious, this cookbook features his love of cooked vegan food. His recipes are all whole foods based (all homemade, no faux meat substitutes and gluten-free, too). Doug’s latest cookbook is based on his extensive experience in the kitchen and wanted to prove the awesomeness of the recipes. So much so that he made them from his own restaurant to share. 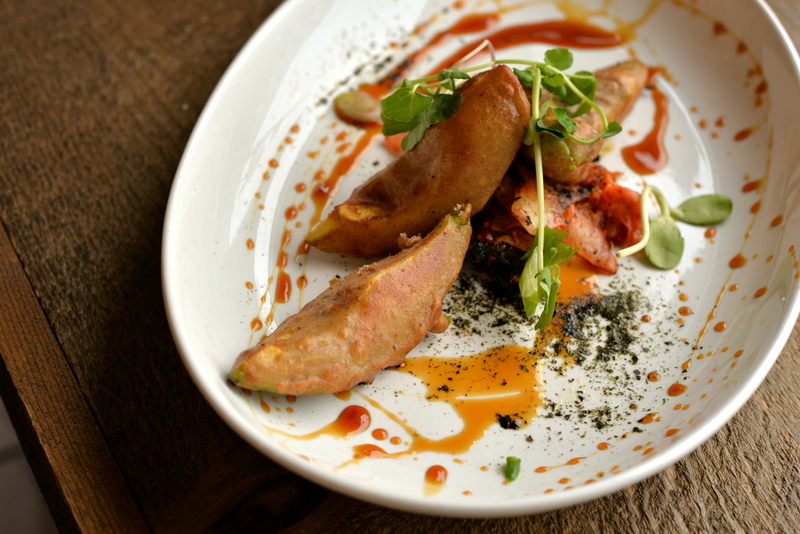 AVOCADO TEMPURA – crisp quinoa battered avocado, spicy kimchi, sweet lemon tamari ginger reduction, nori dust, Chinese five spice. This was excellent. Crispy creamy avocado. I never would have thought to make this at home but it was so good, I may give it a go. 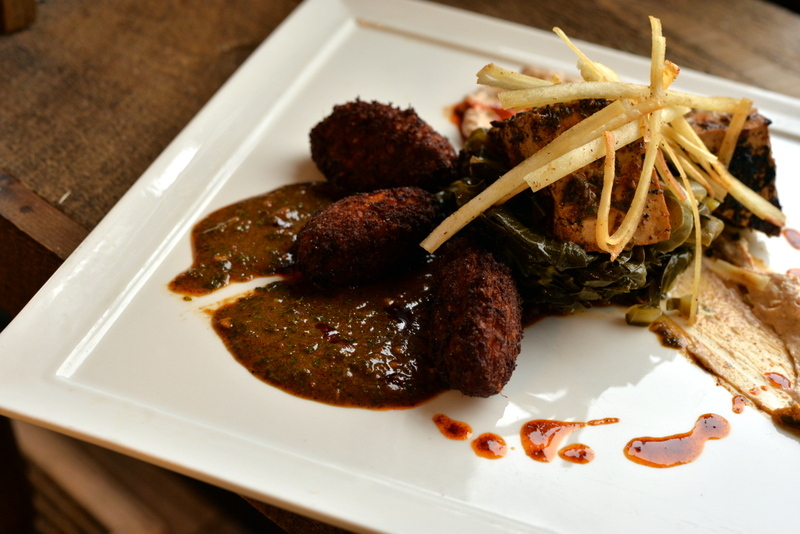 CHERMOULA TOFU – grilled spice rubbed chermoula tofu, braised jalapeños and collard greens, sweet potato quinoa hush puppies, crisp yucca strips, tangy almond cream sauce. Four recipes are from his cookbooks and I don’t think I would have ever thought to combine them together. Other than the sauce being a but heavy, I really liked this. 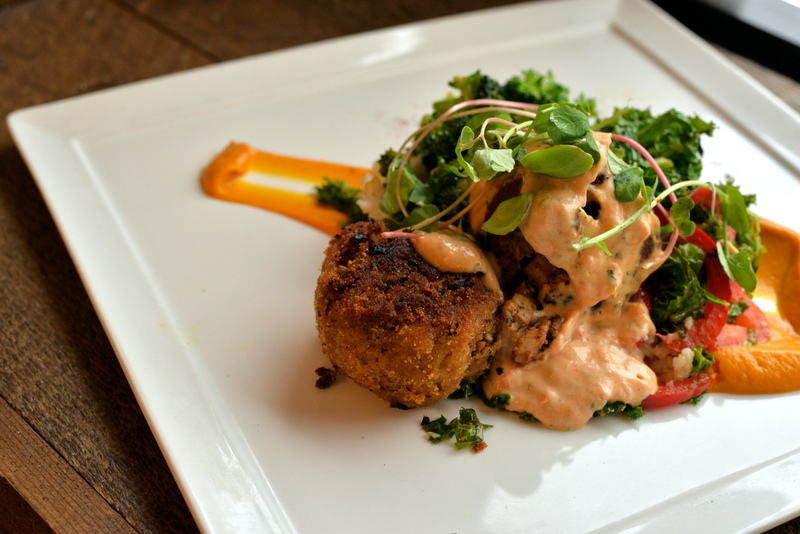 TEMPEH CROQUETTES – crisp cornmeal and brown rice flour crust, roasted red pepper aioli, sweet potato puree, seasoned brown rice, sautéed herbed white wine garlic local veg. The croquettes were fragile but still delicious. 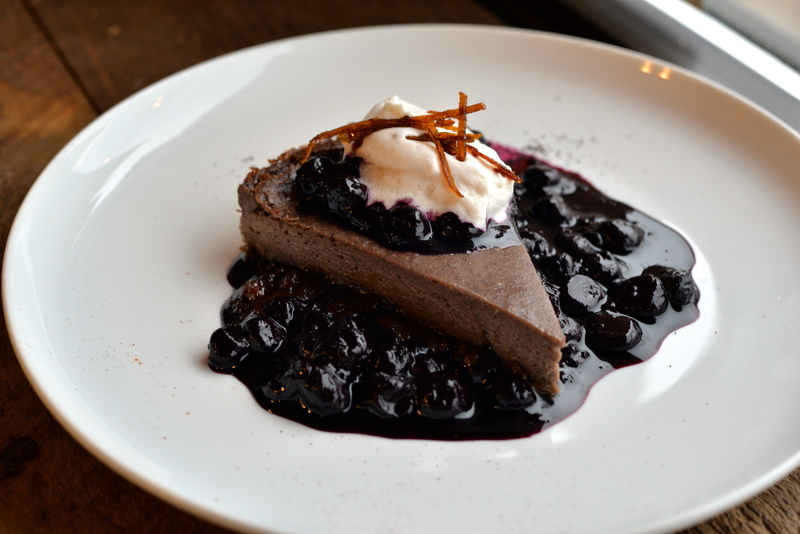 BLUEBERRY CHEESECAKE – soft creamy cheesecake, blueberry compote, ginger crust, candied lemon zest. I was really excited to try this because I knew the recipe from the cookbook used white beans as a secret ingredient. However, this was more cake than cheesecake as bean-based baked goods are ought to do. I will likely not remake this one at home but it was a decent cake. 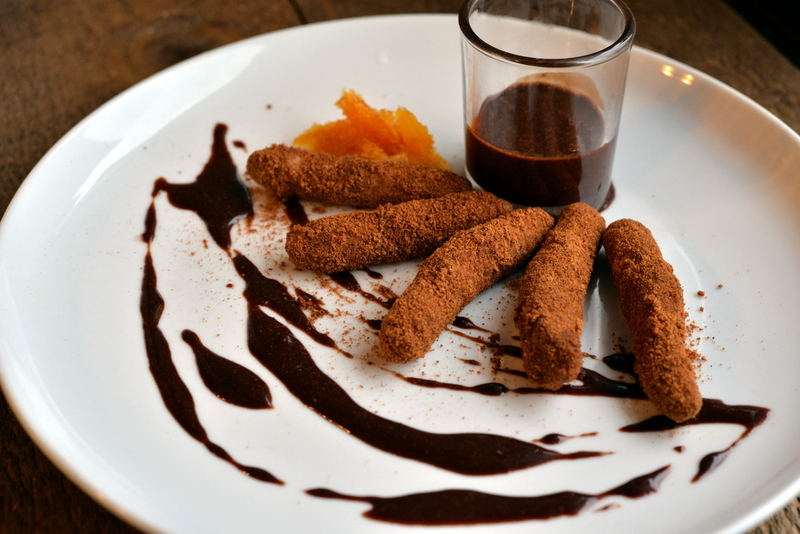 CHURROS – churros with spiced coconut sugar coating, warm cinnamon chocolate dipping sauce, candied orange. This was the recipe that I lured in Rob. He probably considers himself an expert at churros, eating them that is, especially after our stint in Houston. Let’s just say that these were unlike any churro we have ever tried. Churros are naturally vegan but these are also gluten-free which may have been our problem (not sure). 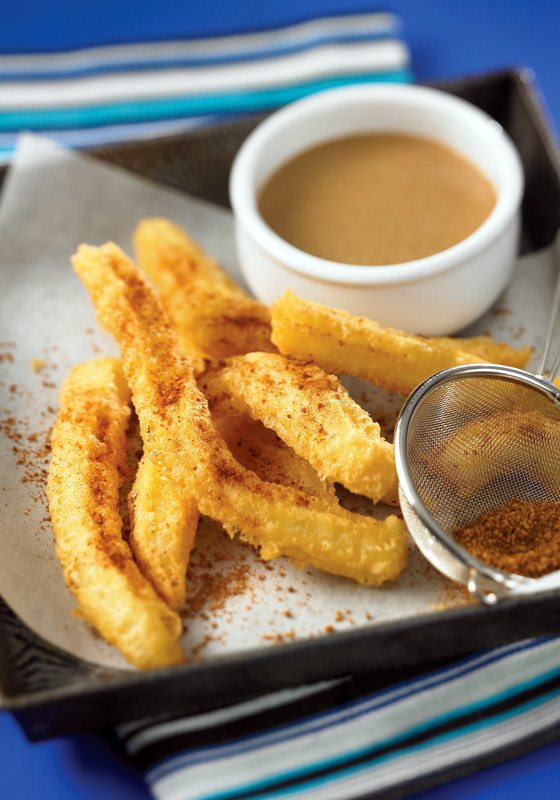 In any case, they tasted great and if anything, could have passed for a gourmet interpretation of churros with a hefty coating in cinnamon and coconut sugar with a delicious warm cinnamon chocolate dipping sauce. As I said, all the recipes are from Doug’s latest cookbook. 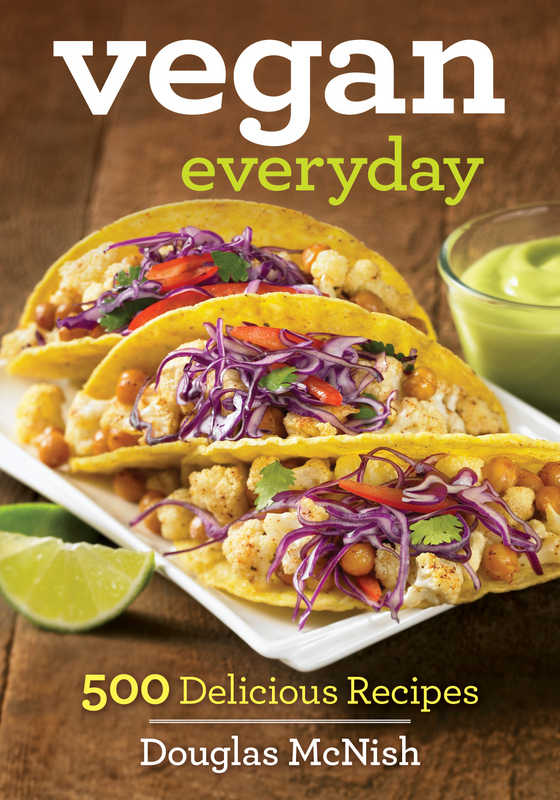 With 500 recipes, there is something here for everyone, from breakfast to dessert and everything in between. If you’ve been to his restaurants or ones where he’s helped shape their menu, you may recognize recipes like his Cheesy Broccoli Quinoa Soup or his Sweet Potato Chili. 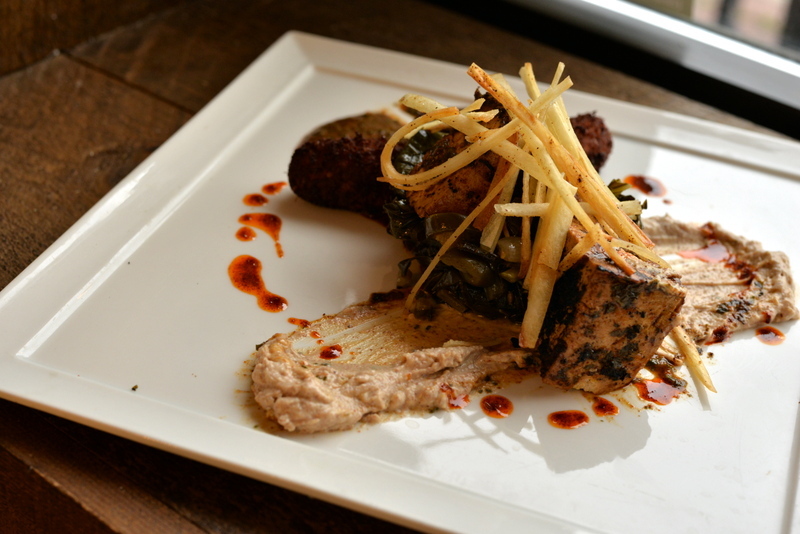 Recipes are quick and easy (Black Bean Santa Fe Wraps) or more elaborate (Miso-Glazed Tofu with Crispy Sushi Cakes and Braised Bok Choy). Then there are recipes I really want to try like Indian-Spiced Date Squares. Or how about Maca Crunch Ice Cream? Honestly 500 recipes feels like a tomb of recipes when most cookbooks share only 100 or so at a time. I have made a few recipes already and they are very good. He definitely knows how to ramp up the umami (bring on the nutritional yeast, tamari and mushrooms). So much so, that I tended to reign them in, worrying about exploding my palate. I will share a homemade recipe in the next few weeks but until then, here is the recipe and cookbook photo for the gluten-free, vegan churros. This is more what I think of when I think of churros, so I look forward to trying the recipe out myself one day. Thankfully, the publisher allowed me to giveaway the cookbook to a reader living in the US or Canada. To be entered in the random draw for the book, please leave a comment below telling me what you generally try to eat every day. The winner will be selected at random on August 20, 2015. Good luck! PS. I am sharing this with We Should Cocoa, The Pastry Challenge, and Shop Local.